We are addicted to positive feedback. We are addicted to being unique and different from everyone else. We crave standing out. Our addiction is fed by advertisements, information and products we consume. Materialism is not the problem. By going away from material or technology we stand out from the crowd once again and find disappointment in other ways. We avoid the negative so much we turn our lives into it without “wanting” to. We find depression and suffering and not knowing why. There’s a concept in some religions about how the opposites play with one another. Everything has both good and bad within it. Everything that is good or bad within may be further broken into good and bad and on and on and on. Good becomes bad and bad turns to good with time and change. Good and bad control one another providing constraints, restraints and substantiate each other. Without one the other makes no sense. Images just don’t make sense without a shadow nor do our egos. We don’t have to focus on good or bad, positive or negative. Choose your duality. Everything has a dual nature and a sense that brings the opposites together. It’s no different in our day-to-day lives. When we receive some bad news there are kernels of goodness that come from it if not today then some tomorrow. Likewise when we achieve some success we only create new opportunities for issues. 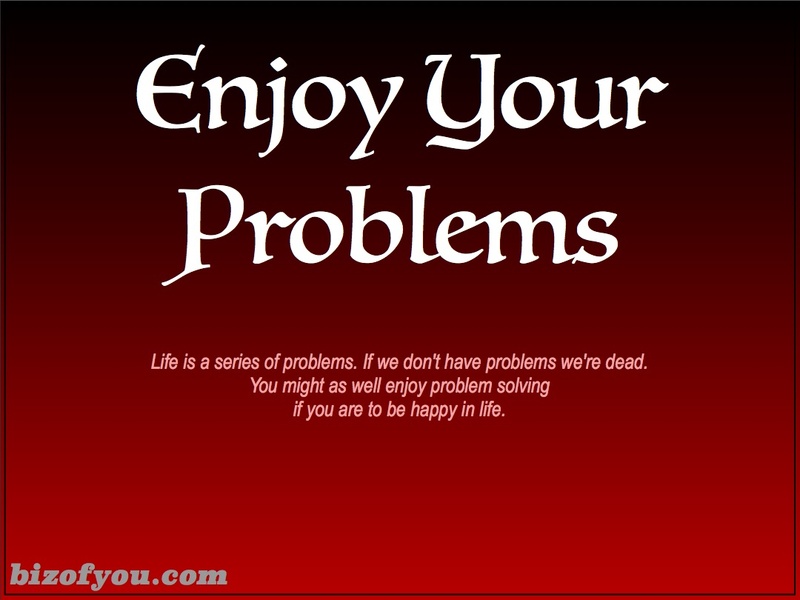 Problems are part of life and we simply need to accept it. Our problems change as we go through life for sure, but there is no ideal state where we don’t have problems while we are alive. Winning the lottery only creates different problems. If we don’t have financial discipline before a big win we won’t have it afterwards. Changing jobs or careers only brings about different pastures to graze our problems from. Relationships come and go and we are left with the same unresolved issues within. Until we accept problem are integral to life, we will simply be controlled by them. We will be at the whims of the market, advertising or the judgement of others. On the other hand if we can accept this fact, we can realize the good and bad in every situation and learn to enjoy whatever may be happening having a wider and longer term perspective. We can let go of our petty little egos and focus on what’s important like doing something with the situation or preserving relationships with others or the environment. In the midst of misery we can realize that this to shall pass transforming into something else. We can seek continual improvement and enable ourselves to achieve what we set out to do with our limited time and energy. We can focus on what we find important and let go of all the other crap. So seek out negative feedback and criticism as that’s where the marrow of life is at considering our societies are so caught up in the positive fluff of life. Instead of allowing self-help gurus, coaches or books to feed our addiction, look in the mirror and say, “Wow you have a lot of opportunities for improvement, let me count the ways.” Then go off and do something about it instead of feeding your obsession with the meaningless fluffy feedback barraging us almost every moment of our information overloaded lives. Separate out what’s real and important and do something with your limited resources of time and energy. When you do, you’ll start truly managing the biz of you and maybe even get something done. Overcome your addiction to the positive in life and start dealing with your problems.